"The Lounge" Downtown Cincinnati Airbnb is Live! After a great rush to fill my friend, agent and fellow flipper, Grant Steed’s condo with all the comfiness, the time has come to hit the SEND button! Now live and ready for your next Cincinnati visit is The Lounge Downtown Cincinnati Airbnb! Let me give you the grand tour! The Lounge is over 2000 square feet, 1100 of which is just in the living room area alone! I kid you not. If you know anything about downtown spaces, you know that that is just ridiculously huge. The space used to be a social club back in the day, so we wanted to bring a little bit of that vibe in and impart a comfortable lounge feel. In order to do that with the large area, we made separate seating areas and places to chill. The main seating area is outfitted with two large chesterfield sofas and huge 4’ square coffee table, all of which face a 65” Roku TV. The windows are one of the best parts of this loft bringing in a ton of light. There isn’t a building directly across from The Lounge, so it feels private despite the wall to wall windows. Behind the sofas in the other half of the front living area is the bar set up with two lounge chairs facing the TVs as well. Moving away from the windows we come to a large dining table with seating for 8. I imagine this as a great place to host a dinner party or work meeting. Across from the dining table is our library stocked with a ton of books. I filled it with as many random books as i could get my hands on. You’ll find anything from finance to romance novels, biographies to thrillers. Take one or leave one. Up to you! Enjoy a book on our chaise lounge that also converts to a twin size bed. Rounding out the living area is this kitchen with a huge island with seating for three making that a total of 20 seats in the living area! The kitchen is fully stocked with everything someone needs on a vacation and then some. Knives that actually cut! Storage containers for leftovers! I try to consider everything! Which means that a coffee bar is A MUST! A 12 cup coffee pot should take care of things nicely. If not, have some tea. Moving onto the bedrooms…I’m all about getting a good night’s rest. So both bedrooms come with a comfy memory foam mattress, organic bamboo sheets and blackout curtains. This condo is in the city, but it’s actually very quiet! I have included a noise machine just in case for those that aren’t accustomed to even the tiniest bit of city noise. The master bath is also very large and comes with two vanities and two shower heads. Lots of room to get ready in the morning. The other bedroom also has a queen bed and all the amenities of the other bedroom. The second bath is in the hallway and includes a tub with shower and plenty of storage. 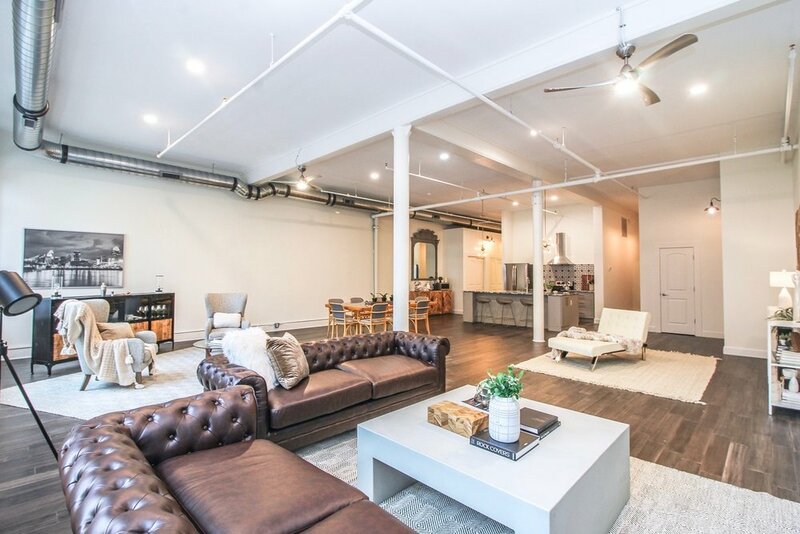 Not only is this loft incredibly comfortable, it’s also in one of the best locations downtown. Situated on the Northern end of the Central Business District puts this loft only one block from OTR. This is basically the best of both worlds. Walk South to all of the attractions on the Ohio River such as the Red’s and Bengal’s stadiums, the restaurants and bars at The Banks, US Bank Arena or come inland a little to Fountain Square and all of it’s attractions. Walk North to OTR and visit a ton of the city’s greatest restaurants, small shops and breweries. Don’t want to walk? The street car passes (quietly) in front of this loft with a stop on the same block. My favorite things nearby though, are the couple of coffee shops just around the corner. We have written up a huge guidebook with all of our favorite places and really had a hard time stopping at what we had. So much good stuff! I’m so excited for you guys to get to see and hopefully visit this great spot now! I stayed here for a week while I was putting it all together and I pretty much didn’t want to leave. The Lounge Downtown Cincinnati is now available for nightly bookings so you can see for yourself. Weekly and monthly discounts are available! Click the link below to see what dates are available!